Boris Johnson has withdrawn London’s membership of the global ‘Mayors for Peace’ initiative, founded by the Mayors of Hiroshima and Nagasaki, CND has learned. Mayors for Peace’s primary goal is ‘to work internationally to raise consciousness regarding nuclear weapons abolition.’ There are currently 2,277 member cities in 129 countries, including Paris, Berlin, Rome, Ottawa, Los Angeles and Sydney.2 Members are drawn from across the political spectrum. Mayor Akiba, the Mayor of Hiroshima, believes that the role of city mayors in raising awareness of nuclear weapons is key, given that cities are the targets of nuclear weapons. ‘We were aware when Boris Johnson was elected that he supported Britain’s nuclear weapons system Trident, but we find it appalling that the Mayor should reject participation in an international body committed to the global abolition of nuclear weapons. 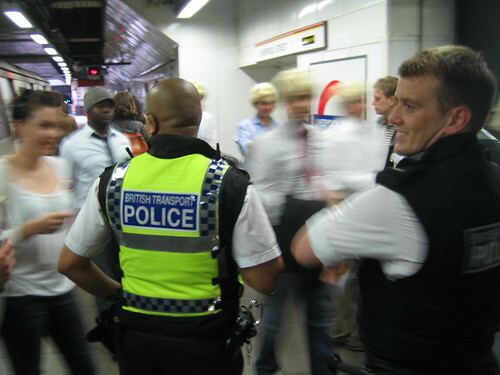 So Boris has his first Press Conference as Mayor of London and defends the Circle Line Tube Party which was celebrating the last night of drinking on the London Underground. He said "It has been anthropologically misunderstood. 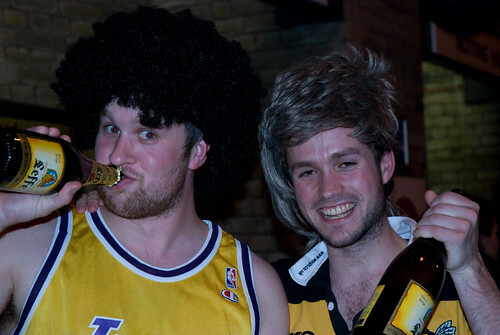 I think what we had there was a kind of exuberant Celtic style wake." Daily Telegraph. 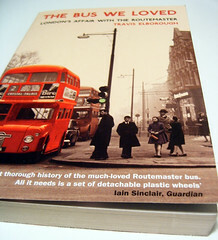 Wasn't one of Boris Johnson's campaign pledges to bring back the Routemaster as the bendy bus was evil? Wonder how many people voted for Boris because of that? "The Mayor's plans for a newgeneration Routemaster may not happen, his new transport boss admitted today. The report continues: "In a visit last week, mayor of New York Michael Bloomberg also warned Mr Johnson to get rid of any manifesto pledges immediately which looked unlikely to work." 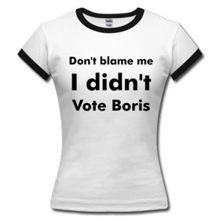 The Tory Troll Blog says "But only one week into his tenure it is clear that Boris must have known full well that this pledge was as dodgy as its costings, well before the capital went to the polls." Boris Watch says "How many times during the campaign did we have to listen to Boris lecturing us on how Ken had once said "only some sort of ghastly, dehumanised moron would get rid of the Routemaster", then done so himself; and how Boris Johnson, knight in shining armour, would be riding to the rescue with a new generation Routemaster to save us all from the moron’s work? I don’t know the answer to that question, but I know it was a lot. But just how much of a ghastly, dehumanised moron would you have to be to spend nine months telling people that if you become Mayor you will bring back an open-backed, conductor-managed "twenty-first-century Routemaster", flying in the face of expert advice and analysis of costings and practicalities, touting this as your flagship policy for months on end… only to have your transport adviser reveal, within your first fortnight in office, that chances are no such thing will ever happen at all?" 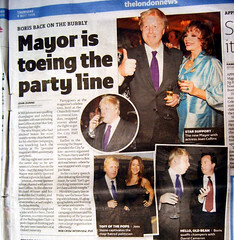 As regular readers of BorisWatchers will know, our new Mayor is no stranger to legal problems. However few would have predicted that with all the Tory advisers money can buy, Boris has still arguably managed to break the law with his appointment of Sir Simon Milton and Kit Malthouse both of whose appointment is seen as a serious conflict of interest. Milton is prohibited from serving in the Mayor's 12 appointed staff as Councillors are not allowed to take senior positions in regional government while Kit Malthouse's position on the assembly should prevent him taking part in Boris's executive. By appointing a member of the assembly into the Executive, Boris has therefore interfered with the separation of powers that enables the executive to be effectively held to account. To try and get around the problems with Milton's status as a Councillor, Boris has exploited a legal loophole and appointed him as a "consultant". While with regards to Malthouse a spokesman for the Mayor said ""This is a grey area and we are trying to come up with new protocols." Rough translation meaning that City Hall is working on a way to try to get around the law so Boris can ensure the Assembly does not work properly. The transparency promised is clearly nowhere to be seen. 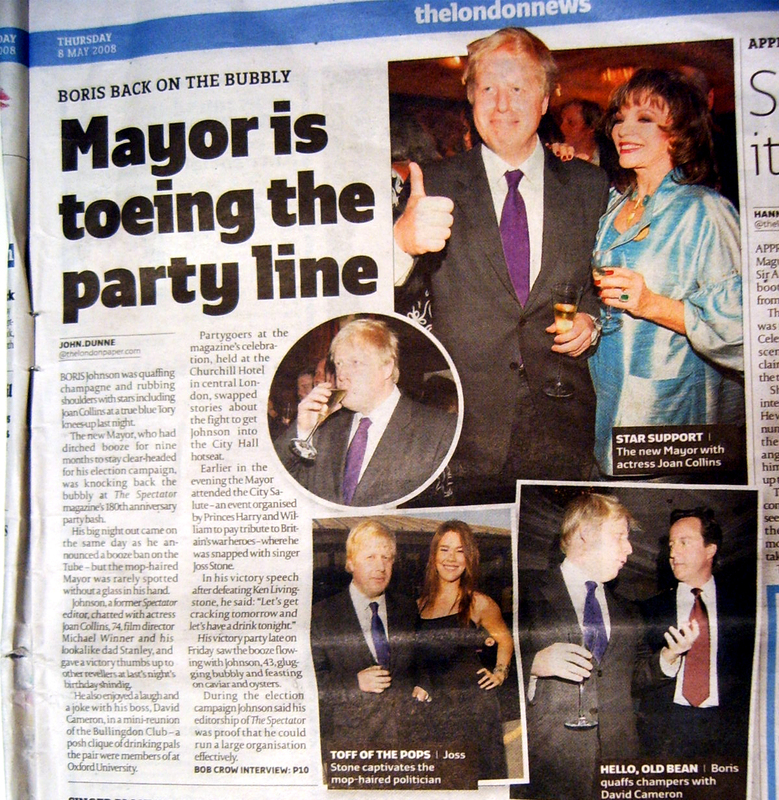 "His big night out came on the same day as he announced a booze ban on the Tube - but the mop haired Mayor was rarely spotted without a glass in his hand." Interesting that the Londonpaper also made the same point as the London Underground Blog - even though Annie made the comment several days before. 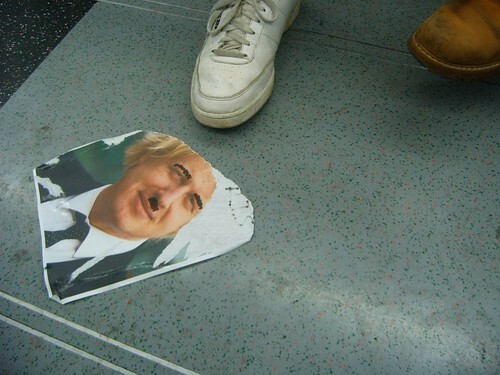 Both she and them found irony in his election victory speech "Let's get cracking tomorrow and let's have a drink tonight", when one of the first transport acts was to ban drinks on the Tube. (see the penultimate paragraph in the report from the Londonpaper which can be compared with the opening of Annie's blog post). Nice to see bloggers possibly influencing how the press report stories again! 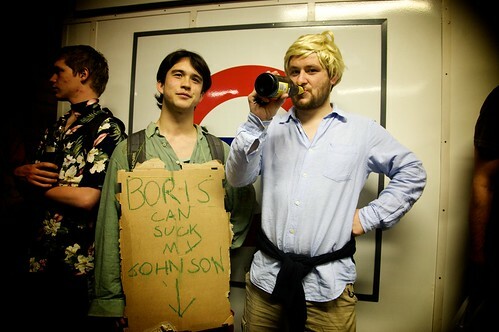 Perhaps Mayor Boris may take up Gus's offer of an interview after all.